A sample of igneous rock. The light-colored tracks show the direction of lava flow. Petrology is a field of geology that focuses on the study of rocks and the conditions under which they are formed. It utilizes the classical fields of mineralogy, petrography, and chemical analyses to describe the structure and composition of rocks. In addition, modern petrologists include the principles of geochemistry and geophysics to better understand the origins of rocks. There are three branches of petrology, corresponding to the three main types of rocks: igneous, metamorphic, and sedimentary. The study of rocks provides us with important information about the nature of the Earth's crust and mantle. In addition, it enables us to gain a sense of the Earth's history, including tectonic processes that occurred over the long course of geological time. On a practical level, the field of petrology helps us gain an understanding of many of the raw materials we rely on for our sustenance and technological development. A sample of quartzite, a form of metamorphic rock, from the collection at the Museum of Geology, University of Tartu. The word petrology is derived from a combination of the Greek words petra (πέτρα), meaning "rock," and logos (λόγος), meaning "knowledge." Igneous petrology focuses on the composition and texture of igneous rocks (rocks such as granite or basalt which have crystallized from molten rock or magma). Igneous rocks include volcanic and plutonic rocks. 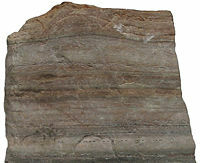 Sedimentary petrology focuses on the composition and texture of sedimentary rocks (rocks such as sandstone, shale, or limestone which consist of pieces or particles derived from other rocks or biological or chemical deposits, and are usually bound together in a matrix of finer material). 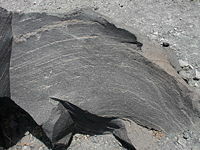 Metamorphic petrology focuses on the composition and texture of metamorphic rocks (rocks such as slate, marble, gneiss, or schist which started out as sedimentary or igneous rocks but which have undergone chemical, mineralogical or textural changes due to extremes of pressure, temperature or both). Experimental petrology employs high-pressure, high-temperature apparatus to investigate the geochemistry and phase relations of natural or synthetic materials at elevated pressures and temperatures. Experiments are particularly useful for investigating rocks of the lower crust and upper mantle that rarely survive the journey to the surface in pristine condition. The work of experimental petrologists has laid a foundation on which modern understanding of igneous and metamorphic processes has been built. 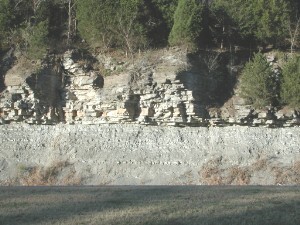 Two types of sedimentary rock, limey shale overlaid by limestone, observed at Cumberland Plateau, Tennessee. Their minerals and global chemistry provide information about the composition of the Earth's crust and mantle. Their ages can be calculated by various methods of radiometric dating, and a time sequence of geological events can be put together. Their features are usually characteristic of a specific tectonic environment, allowing scientists to reconstitute tectonic processes. Many rocks host important ores that provide valuable raw materials that we rely on for our sustenance and technological development. ↑ "Petrography" is a branch of petrology involving the study of the mineral content and textural relationships within rocks. The term "lithology" was once roughly synonymous with petrography, but today lithology is essentially a subdivision of petrology focusing on macroscopic hand-sample or outcrop-scale description of rocks. PETDB: Petrological Database of the Ocean Floor Center for International Earth Science Information Network (CIESIN), Columbia University. This page was last modified on 18 March 2019, at 21:17.